I love going to the Big Lots closeout store. Especially the one about 20 minutes outside of town in the "boonies" where several of my friends share a house. I almost always find tons of organic and natural non-perishable food items out there for CHEAP...untouched by the traditional country shopper. 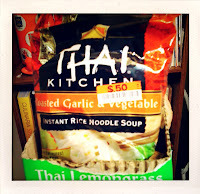 Thai Kitchen's Instant Rice Noodle Soup varieties are already cheap (about 70-90 cents/pack), but I recently found every variety marked at $.50 and so I stocked up on about $10 worth for the winter. I was visiting with my friends after my shopping trip, enjoying the unseasonably beautiful November weather with great company, good beer and a little smoke. Before long I had to put something in my belly and my little soup packet came to the rescue!! They make great quick meals (take about 5-7 minutes to cook). Sometimes I'll drop and egg in at the end of cooking the soup to make and Egg Drop Noodle soup, but on this particular day I added a few nuggets of Quorn "Chicken" and some cooked spinach that my friend was making in another pot. These little guys travel well and taste great on their own, but it's always fun to try adding different varieties of veggies and protein. Follow directions on package of Thai Kitchen soup. 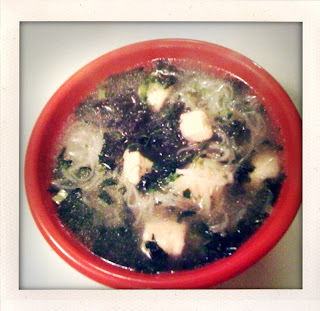 Add Chicken when you add the noodles into the soup. Add cooked spinach (I usually use frozen spinach, but you can steam some fresh spinach). Pour into a bowl and let it sit for a few minutes before eating...it will be HOT!!! Then dig in and slurp some noodles. Sprinkle Some Fries on those Cupcakes.